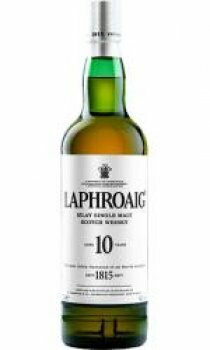 Laphroaig Malt Whisky is distilled in the Islay region of Scotland. Laphroaig (pronounced la-froyg) is one of the most distinctive of all malt whiskies. The distillery was built in the 1820s by Donald and Alex Johnson whose family name is still on the label. In 1847 Donald died in a somewhat bizarre accident after falling into a vat of partially made whisky ('burn't Ale'). Laphroaig (Gaelic: The beautiful hollow by the broad bay) has its own peat beds on Islay. Its maturation warehouses face directly on to the sea. For many, it is an acquired taste, but one which rewards persistance. Its palate is smokey with a long aftertaste. If you like Islay smokey whiskies, then you'll love this one, you can almost taste the sea.